I’ve been meaning to do this for a while and finally I did: a comparison of the same wine sampled three different ways. One, in an Eisch breathable glass; two, poured through a Vinturi; and three, poured from the bottle into a normal glass. For the two non-Eisch glasses, I used a couple of Riedel sommelier Montrachet stems since those were the closest I had to the same shape as the Eisch. The Eisch had a larger bowl, however. The guinea pig wine was a 2004 Simi Cabernet Sauvignon from the Alexander Valley. I don’t know how much it cost since it was a gift but the average cost reported on Cellar Tracker is about $18.00. I uncorked the wine and immediately poured equal amounts into each glass – no decanting, no air time. I put the cork back in the bottle and let the unused portion sit on the counter. First impressions: the color was the same in all three cases, haha. Aromas: After five minutes, I started with the plain glass, moved to the Vinturi and then the Eisch. From the plain glass, I sensed very nice berry and plum aromas mixed with some vanilla and a small bit of smokiness. The Vinturi sample was no different, as far as I could tell. The aromas from the Eisch glass were similar but I also detected a clay and earth component not present in the other two. Thinking maybe the glass was dusty or something, I poured out the wine and refilled it. Nope, not dusty – that same component was there. Palate: Nice, silky and smooth mouth feel. The taste was similar to the aromas, with plums being the most prevalent flavor. The finish was rather short, with the fruit disappearing and replaced by a watery/minerally taste along with what reminded me of chewing on apple peels. Oh, I forgot to tell you which glass that was. Well, it was all of them. I don’t think I have a golden palate so maybe that accounts for it, but I really could not detect a consistent difference between the different glasses. I sampled the wine about every 10-15 minutes over the course of 2 ½ hours, spitting it out each time. After about 20 minutes the clay and earth I initially sensed from the Eisch glass had disappeared. From that point onwards there really was no difference in aromas or taste throughout the tasting session. When I thought there was a difference, going back and forth between the glasses in various orders made me conclude there was no consistent difference that was identifiable with any one sample. 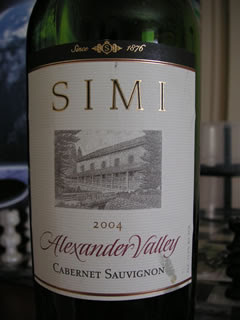 All in all the Simi was a nicely balanced, straightforward wine with nice fruit but not much complexity. Personally, I wouldn't pay $18 for it. The wine itself got a bit smoother as it sat in the glass but I didn’t notice any major changes. At the end of the session, I poured a sample from the bottle that had been sitting on the counter. The fruit in the aromas was more intense and there was also a slight animal or barnyard character to them. The fruit also tasted a touch brighter from the saved bottle over the glasses but the character was the same. Like I said, I don’t have a golden nose or palate so maybe the subtleties were lost on me but I did not find any appreciable differences between the wine in the Eisch glass, poured through a Vinturi, or just left on its own. Elsewhere, others have reported significant differences but I’m gonna have to pass on that one. Another factor may be the wine itself. This probably would have been a better experiment had I chosen a young, tannic monster of a wine that had more potential to develop in the glass. The Simi was already quite drinkable. However, since I am the one wine per week person who normally only buys one bottle of any given wine, I didn’t have any other bottle to spare since that would have been my only one of that specific wine. That reminds me of the controversy among audiophiles, some of whom claim they can hear differences between different cables used to connect their components, whereas others say it is a sham and a $2.00 cable sounds the same as a $100 Monster Cable. I fall into the latter camp – I don’t have golden ears, either, and haven’t detected any difference when I switch cables. I guess that’s a good thing, huh? Or maybe not. To the good, it means there is no use for me to spend extra money on extra gadgets (even though I already have) but to the bad, maybe it means my senses are doltified. In other words, giving me very fine wine is like putting pearls before swine. Oh well, all I can do is keep on tasting, right? In any event, it’s an enjoyable pastime. "$2.00 cable sounds the same as a $100 Monster Cable." Dude, these two are the SAME cable...but the branding of one costs you $98 more. Reading about breathable glasses made me think about the audio comparision. Now, I read it here :-). There are 2 things in audio: Do I hear a difference and do I want to pay for that. Well, YES there are differences. Play a couple of Cd's or records you know really well. And be open minded.